Interviewers try to find out if you go from one interview to another, or if their hotel (company) matters to you (at least somehow), and if you spent some time researching about their place, goals, and values. You should realize one thing before answering this question: The people who will interview you for the job are typically proud of their hotel (or company). The will know a lot about the place. The more you know about the place, the easier it will be for you to connect with them, to make a good impression. Find something you can compliment about their place (your pre-interview research will help you with the task), and point to that thing while answering this question in an interview. Your hotel has excellent guest reviews on all major websites. 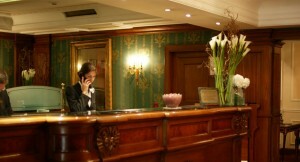 It has a wonderful location, and I believe it is one of the best places to stay in the city–if not the very best one. I would be proud to work here as a receptionist, and can not imagine a better place for my work. I really like the variety of activities you offer to all groups of guests. Swimming for children, thematic evenings for elderly couples, and romantic dinners for everyone. The rooms are really nice; the staff I’ve met here looked professional. I would be happy to become a member of this team. I have purchased some furniture from you before, and I enjoyed the customer service in your store. From the beginning to an end of my purchase, I felt that someone cared. I like the values and rules you follow in this place, and I want to be a part of this team, as a receptionist.